This new image of an X-class solar flare was captured by NASA’s Solar Dynamics Observatory on March 29, 2014. The sun emitted a significant solar flare, peaking at 1:48 p.m. EDT March 29, 2014, and NASA’s Solar Dynamics Observatory captured images of the event. Solar flares are powerful bursts of radiation. Harmful radiation from a flare cannot pass through Earth’s atmosphere to physically affect humans on the ground, however — when intense enough — they can disturb the atmosphere in the layer where GPS and communications signals travel. To see how this event impacted Earth, please visit NOAA’s Space Weather Prediction Center at http://spaceweather.gov, the U.S. government’s official source for space weather forecasts, alerts, watches and warnings. This flare is classified as an X.1-class flare. X-class denotes the most intense flares, while the number provides more information about its strength. An X2 is twice as intense as an X1, an X3 is three times as intense, etc. 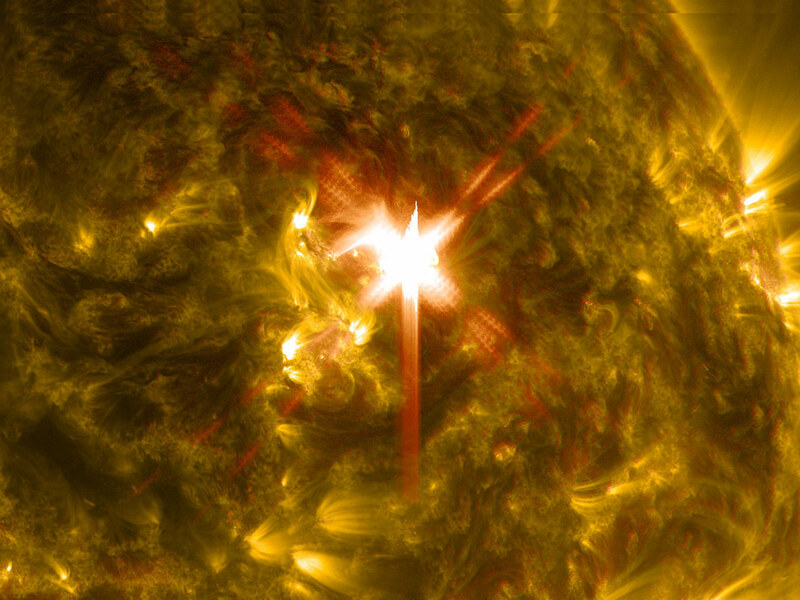 Be the first to comment on "New SDO Image of X-Class Solar Flare"